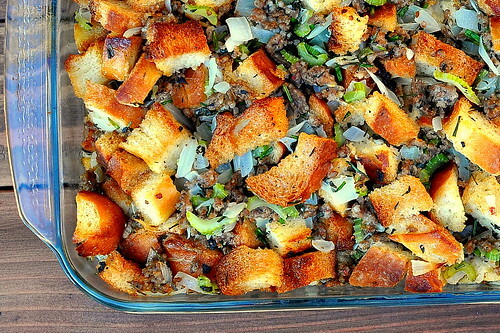 If I had my way, stuffing would be the centerpiece of Thanksgiving. An expertly roasted bird has its merits, as do silky potatoes dotted with butter and doused in gravy, but for as long as I can recall, my heart and stomach have belonged to stuffing. I grew up on the Stove Top variety that my aunt brilliantly doctored-up with onions, celery, and chicken gizzards. I later moved on to a gourmet version made with cornbread and dried fruit that my brother outsourced from his neighborhood Dean & Deluca. From low end to high end to everything in between, I’ve yet to encounter a stuffing that didn’t appeal to me. While my soy sauce-brined turkey was roasting in the oven at 325 degrees, I got started on making the stuffing, which fortuitously called for similar temps. Preparing a turkey and stuffing all in one day was admittedly a lot of work for a first-timer, but it would’ve been a travesty eating a thirteen pound bird without some proper dressing on the side. I chose a classic sausage, herbs, and French bread recipe from this month’s Cooking Light magazine. Its straightforward flavor profile and manageable ingredients list spoke to me, and I couldn’t have been happier with the results. 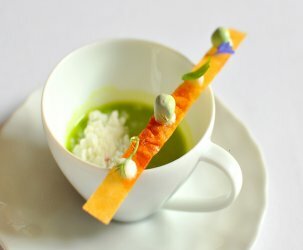 The bread had an awesome custard-like consistency, while the trio of herbs perfumed each bite. The stuffing-specific sausage that I picked up from Trader Joe’s was too crumbly and mild for my taste, but it didn’t detract from the overall success of the dish. Next time, I’ll be sure to use my favorite spicy Italian sausage instead. My mom’s already called dibs on stuffing for this year’s Thanksgiving feast, but hopefully next year I can share this gem with the fam. And for good ‘ol times’ sake, I’ll even add in some chicken gizzards. Preheat oven to 350°. Arrange bread in single layers on 2 jelly-roll pans. 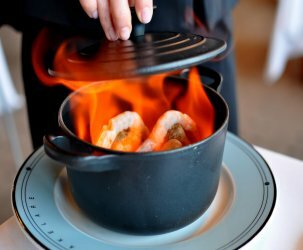 Bake at 350° for 20 minutes or until golden, rotating pans after 10 minutes. 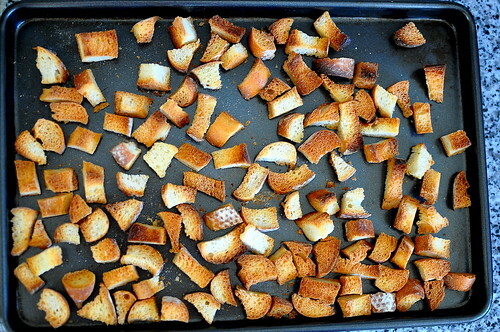 Turn oven off; leave pans in oven for 30 minutes or until bread is crisp. Melt butter in a large skillet over medium heat. 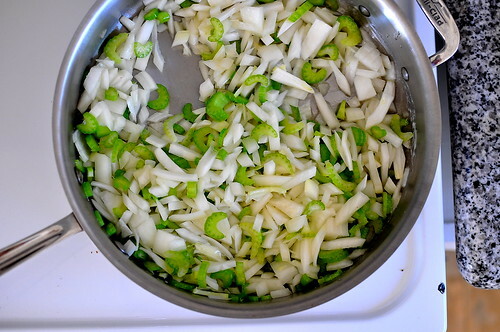 Add onion and celery; cook 11 minutes or until tender, stirring occasionally. Transfer vegetables to a large bowl. Add sausage to pan. Increase heat; sauté 8 minutes or until browned, stirring to crumble. Remove sausage from pan using a slotted spoon; add sausage to vegetable mixture. Stir in bread, herbs, and pepper; toss. Combine broth, 1 cup water, and egg, stirring well. Drizzle broth mixture over bread mixture; toss. Spoon mixture into a 13 x 9-inch glass or ceramic baking dish coated with cooking spray; cover with foil. Bake at 350° for 25 minutes. Uncover and cook 20 minutes or until browned. I, too, consider stuffing to be the highlight of Thanksgiving dinner. Your recipe is similar to the stuffing I usually make – with good spicy Italian sausage + a handful of chicken livers sauteed and mashed into small pieces, and also some rosemary in the herb mix. 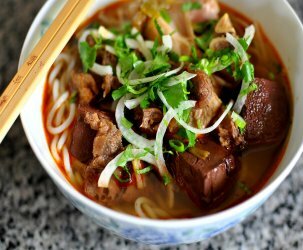 I would highly recommend adding a chopped granny smith apple to that – the sweetness of the apple is a wonderful contrast to the other savory flavors. If you don’t like apple, you can also consider tossing in some dried fruit, like currants or cranberries. This year, I tried a new ingredient addition: adding about 1 cup of grated parmesan to the mix. I think that will become a staple ingredient from now on! Yes! Stuffing (or Dressing as we like to call it in the South) is the best dish this time of the year. I love a good cornbread stuffing. I love Tracy’s suggestion of adding apple or dried cranberries for an extra pop of flavor. Well done! i love stuffing!! my motto is, mo’ bread is mo’ good. that looks good and manageable. I would say that a lot of us would agree that stuffing trumps the bird on Thanksgiving. Yours looks great! Like the idea that you removed the sausage casings too! 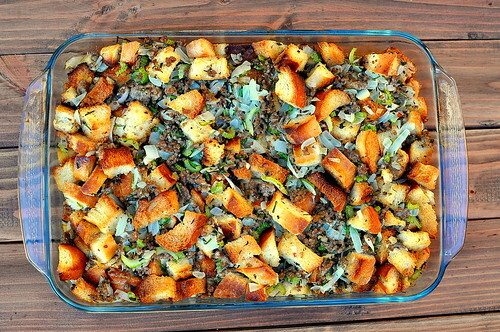 This stuffing is so beautiful! I love the colors. The bread looks so buttery and crunchy. Thanks for sharing! I love stuffing too, we never have enough leftovers… I think we are going to butterfly the bird and cook the stuffing in the oven, which makes it dressing? You’re getting us all primed with these posts! Mmm I love sausage and sage – really makes me feel like I’m in the season. Add some apple (and gizzards if your name is Cathy) and its magic! CANNOT wait to try this! My mom has already spoken on making the stuffing for Thanksgiving, but i still foresee this in my near future! Just made this and put two nice dishes in the fridge ready to go tomorrow. The smells of the fresh herbs are amazing, I can’t wait to gobble this up (pun fully intended). Found some apple and onion pork sausage and turkey cranberry poutltry sausage which I mixed together for this, hopefully it tastes as goood as it smells. These are the main ingedients in my yummy stuffing that I have made all my life, as did my grandmother as I’m sure her mother as well. It’s a very traditional stuffing that I cook with turkey at Thanksgiving, Christmas and Easter. I usually double this recipe as we all love stuffing at our house. I use 2 loaves of bread, 2 packs of sausage, about 8 large onions, and the sage, savory, thmye, salt, pepper and butter. Break up a loaf of cheap store brand white bread into 1 inch pieces and let sit overnight on the counter to dry out a bit. In the morning, fry a package (comes in a plastic wrapped tube) of Maple leaf Pork Sausage. (This sausage is ground, and not in casing). Don’t overcook if you are stuffing a bird with this stuffing, leave some moisture/fat in it. Drain sausage well, set aside. Cut at least 4 LARGE Vidalia onions (**you want to use a lot of onions, this adds sweetness to the stuffing as well as moisture content to your bird, stuffing**) into small pieces and fry in a 1/2 pound of butter. Onions should be cooked on low temperature as you want them transluscent, with no carmelization. Combine sausage and onions with butter. Add lots of ground sage, minimal ground savoury, lots of ground thyme, and minimal salt & black pepper. You will probably need to add in another 1/2 pound of butter at this point as you require lots of fat to mix with your bread, this will disperse spices equally. Make sure you taste to ensure you have enough seasoning, it will seem like you are using way to much but you aren’t! remember this is to flavour all of the bread, and if you are stuffing a turkey it will flavour your bird as well. 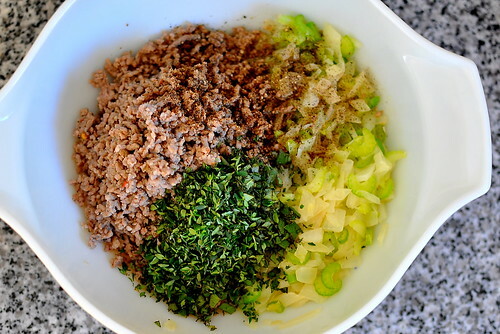 Once you are happy with the seasoning, mix in with bread crumbs. 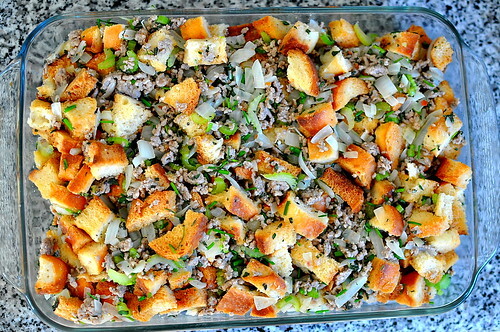 Stuffing should be moist and clump together if you squeeze it. If you find it is too moist, add more bread, too dry, add more butter. Remember to adjust your seasoning is you do this. Stuff your bird right away and cook. If you have leftover stuffing, just wrap in aluminum foil and leave on stove top. One hour before your bird is done, remove some turkey dripping from the pan and sprinkle on stufing in the foil pack, reseal and place in oven. When you remove your stuffing from the bird cavity, mix in the foil pack of stuffing for extra! Enjoy! Yes this is fattening, but really, isn’t stuffing the best part of turkey dinner?